LOS ANGELES — If you want to be seen as a bonafide automotive maverick, there’s no better way than to pull up in a three-wheel car. But engineering executive Paul Elio thinks the time has come for the commuter “car” he has shown here. He hopes to sell it for as little as $6,800 and claims gas mileage as high as 49 miles per gallon in the city, 84 mpg on the highway. It has one door, two seats and three wheels. The driver sits in front of the passenger. •Safety. Like all three wheelers, Elio would be regulated by the government as a motorcycle, but Elio says he aims to meet car five-star safety standards. It will have three airbags and energy-absorbing zones for crashes. •Features. The vehicle would have standard air conditioning, audio and power windows. With its three-cylinder, 55-horsepower engine, it has a top speed of 100 miles per hour. •Affordability. Elio envisions a financing plan for buyers to pay little or no money up front and get credit card that would charge them triple for gasoline with the surplus used to pay down the loan. He says high fuel economy would offset the gas price. 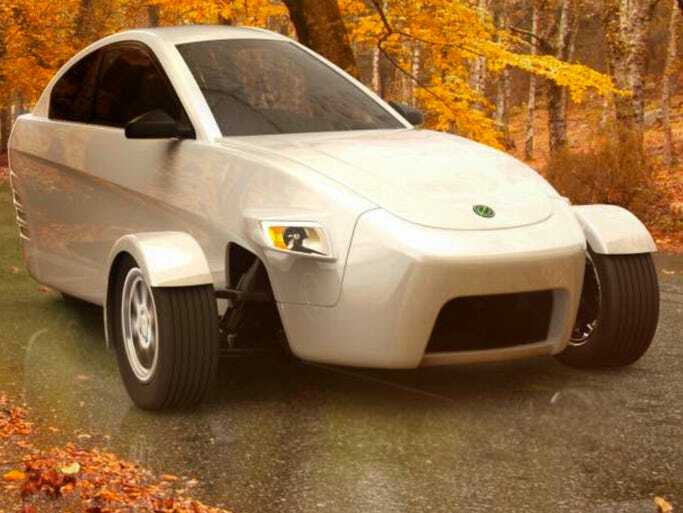 Though the idea might seem three-wheel lunacy, Elio is not easily dismissed. He says he has raised $47 million, secured a former General Motors’ plant in Shreveport, La., for production and taken 5,563 reservations as of last week, for which buyers plunked down $100 to $1,000. All he needs is $200 million. People worry about about safety, noise and small size compared to other vehicles. “They don’t see it as a car. They see it as an enclosed three-wheel motorcycle,” Cogan says. Others agree. Then there is practicality. “It’s fine if you’re going to use it as a moderate-distance commuter (car). It’s not something you’d take on a long trip,” says Joe Phillippi of AutoTrends Consulting. Elio committed to the idea during the 2008 gas price spike and says his marketing surveys show enthusiasm still high despite critics and lower gas prices.